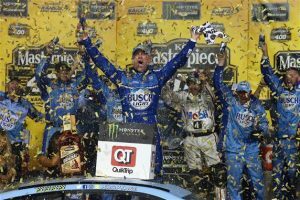 KANSAS CITY, Kan. – Kevin Harvick, nicknamed NASCAR’s “Closer,” earned his moniker on Saturday night at Kansas Speedway, passing reigning Monster Energy NASCAR Cup Series champion Martin Truex Jr. on the next-to-last lap to add the KC Masterpiece 400 to his collection of victories this season. Charging from sixth place and chasing race leader Martin Truex Jr. after a restart on Lap 259 of 267, Harvick found speed in the top lane with five laps left and passed Truex on the outside through Turns 3 and 4 on the penultimate lap. In winning his second straight race and his fifth in 12 starts this season, Harvick beat Truex to the finish line by .390 seconds. The victory was Harvick’s third at Kansas Speedway, tying him for most ever at the 1.5-mile track. “I think, as you look at the last couple of laps, it wasn’t working for me on the bottom, and I was able to make up some ground on the top,” said Harvick, who will try to win three straight races in the No. 4 Stewart-Haas Racing Ford for the second time this season when NASCAR’s top tour goes to Charlotte for the May 27Coca-Cola 600. Having taken the lead by staying out on older tires after a caution for an accident involving Kyle Larson and Ryan Blaney on Lap 248, Truex thought he could keep Harvick behind him over the closing laps. That proved not to be the case. The most violent accident of the night set up the final restart with nine laps left and the dramatic pass for the victory. In Turn 4 on Lap 253, William Byron got loose underneath Clint Bowyer’s Ford and knocked Bowyer up the track. Byron’s No. 24 Chevrolet slammed into the outside wall with a bone-rattling impact that lifted the rear of the car off the pavement. Byron’s car landed on the hood of Ryan Newman’s Chevrolet and slid down the track with fire in the engine compartment. All told, seven cars were involved in the wreck, including the No. 6 Ford of Matt Kenseth, who finished 36th in his first race of the season. Byron was shaken but otherwise unhurt after the multicar wreck. Joey Logano ran third, followed by Larson and Denny Hamlin. Larson made a remarkable recovery after he and Blaney made contact in Turn 1 on Lap 248, when Blaney was trying to side-draft aggressively. Blaney, who led 54 laps before the accident, slammed into the Turn 1 wall and exited the race. But Larson continued, and he took on fresh rubber under the final caution and charged through the pack to fourth place. “Blaney was side-drafting really hard, and I was as high as I could get, and we made contact, whatever, and we had a bunch of damage,” said Larson, who won the second stage and led a race-high 101 laps to Harvick’s 79. “So I hate that we didn’t turn today into a win, but it’s satisfying to see how much speed our car had tonight. Paul Menard, Erik Jones, Kurt Busch, Aric Almirola and Kyle Busch completed the top 10. Kyle Busch retained the series lead by 12 points over Logano in second place and 19 over Harvick in third. Brad Keselowski (14th on Saturday) is a distant fourth, 107 points back. (1) Kevin Harvick, Ford, 267. (7) Martin Truex Jr., Toyota, 267. (9) Joey Logano, Ford, 267. (22) Kyle Larson, Chevrolet, 267. (6) Denny Hamlin, Toyota, 267. (11) Paul Menard, Ford, 267. (12) Erik Jones, Toyota, 267. (8) Kurt Busch, Ford, 267. (4) Aric Almirola, Ford, 267. (3) Kyle Busch, Toyota, 267. (16) Ricky Stenhouse Jr., Ford, 267. (17) Chase Elliott, Chevrolet, 267. (20) David Ragan, Ford, 267. (5) Brad Keselowski, Ford, 267. (33) Clint Bowyer, Ford, 267. (18) AJ Allmendinger, Chevrolet, 266. (25) Austin Dillon, Chevrolet, 266. (19) Alex Bowman, Chevrolet, 266. (23) Jimmie Johnson, Chevrolet, 265. (36) Michael McDowell, Ford, 265. (34) Kasey Kahne, Chevrolet, 264. (37) Matt DiBenedetto, Ford, 263. (21) Darrell Wallace Jr. #, Chevrolet, 262. (27) Corey LaJoie, Chevrolet, 262. (31) Landon Cassill, Chevrolet, 260. (28) Ross Chastain(i), Chevrolet, 259. (30) * Reed Sorenson, Chevrolet, 259. (14) Daniel Suarez, Toyota, 258. (29) Gray Gaulding, Toyota, 257. (15) Ryan Newman, Chevrolet, Accident, 253. (24) Jamie McMurray, Chevrolet, Accident, 253. (38) * Timmy Hill(i), Toyota, 253. (13) William Byron #, Chevrolet, Accident, 252. (10) Chris Buescher, Chevrolet, Accident, 252. (32) BJ McLeod(i), Chevrolet, 251. (35) Matt Kenseth, Ford, Accident, 250. (2) Ryan Blaney, Ford, Accident, 247. (26) Ty Dillon, Chevrolet, Accident, 247. Average Speed of Race Winner: 128.395 mph. Time of Race: 2 Hrs, 53 Mins, 38 Secs. Margin of Victory: 0.390 Seconds. Caution Flags: 6 for 31 laps. Lap Leaders: K. Harvick 1-32; R. Blaney 33-84; K. Harvick 85-123; R. Blaney 124-125; A. Dillon 126-129; K. Harvick 130; K. Larson 131-213; J. Logano 214-215; R. Stenhouse Jr. 216-225; K. Larson 226-243; K. Harvick 244-248; J. Logano 249-252; M. Truex Jr. 253-265; K. Harvick 266-267. Leaders Summary (Driver, Times Lead, Laps Led): K. Larson 2 times for 101 laps; K. Harvick 5 times for 79 laps; R. Blaney 2 times for 54 laps; M. Truex Jr. 1 time for 13 laps; R. Stenhouse Jr. 1 time for 10 laps; J. Logano 2 times for 6 laps; A. Dillon 1 time for 4 laps.